Fell in love with this amazing recipe where corn and potatoe are baked in Philips Airfryer to further enhance the flavor. While baking only, you will feel that delighful aroma. Mind you this recipe is without cheese but it surpasses cheese to give that beautiful lovely texture on top. 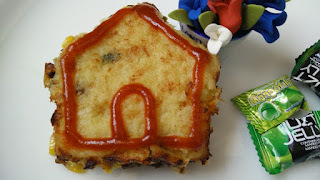 Try making this recipe in different shaped baking tins to make it more attractive for kids just like we have used this hut.. In a pan, heat half quantity of butter, sauté onions, corn, and capsicum. Add salt and chaat masal. Saute for 5 min. Meanwhile mash the potatoes, add remaining butter, 1 tsp of mayonnaise. Mix it completely to get a smooth potato paste. Cut out a bread slice as per the shape of the baking dish and spread a layer of remaining mayonnaise on it. Either Grease the baking tray or cover with foil paper. Place the bread slice in baking dish. Top the bread slice with corn mixture and then spread a layer of potato paste. Bake it in preheated airfryer at 200 degrees for 10 min. Allow it to cool down and then remove from the baking tin. Serve hot with chips, candies, ketchup.